The Horizons Marijuana Life Sciences Index ETF (HMMJ.TO) reclaimed the $1 billion mark on Monday. Assets in the fund had dipped as low as $624 million on Dec. 21. 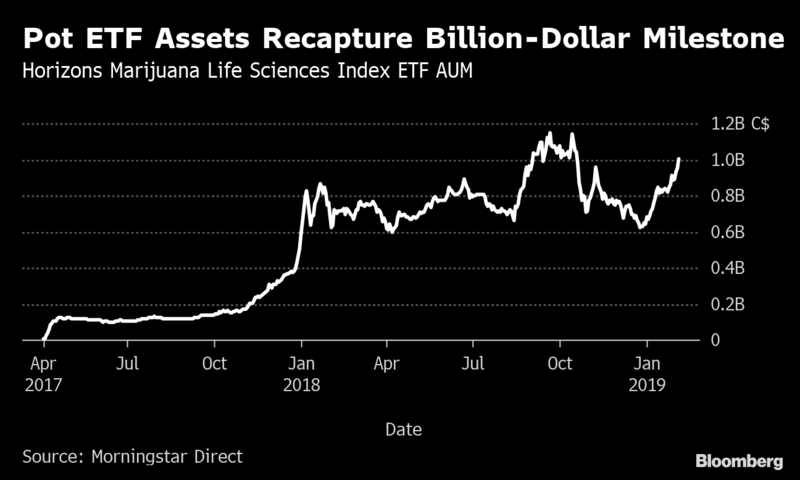 The Horizons Marijuana ETF, better known by its ticker HMMJ, was the first exchange-traded fund to track the cannabis industry but it’s no longer the biggest. That honor belongs to the U.S.-based ETFMG Alternative Harvest ETF (MJ.N), which surpassed US$1 billion in assets this week for the first time. The rally comes amid potential political catalysts in the U.S., including a statement from Attorney General nominee William Barr that he’ll respect state marijuana laws, and ahead of the first post-legalization earnings next week from major cannabis producers Canopy Growth Corp. and Aurora Cannabis Inc. (ACB.TO). Pot stocks have also gotten a boost from broader market optimism, with Canada’s S&P/TSX Composite Index up nearly 10 per cent this year.